Coconut milk | Retired? No one told me! Dairy Free Lemongrass Icecream and the Amazing Coconut. Coconut cream makes the best ice cream… Ever! Ice cream: using just 4 main ingredients this lovely icecream cost me virtually nothing to make as we grow Coconuts and lemongrass. This ice cream is also dairy free. It doesn’t get any better than that. Does it? Coconut and Lemongrass Ice Cream. Put 400ml of coconut cream in a saucepan and add 3 stalks of crushed lemongrass. Slowly bring to a soft rolling boil and remove from the heat. Set to one side and leave to infuse the lemongrass flavour for about 35 mins. In a medium-sized bowl put 1 large egg and 2 egg yolks, 125gm coconut sugar and a pinch of salt. Put the bowl over a saucepan of boiling water, but ensure the bowl does not touch the water, as your eggs will scramble. Whisk the mixture until it is thick and frothy. Gradually add the coconut cream still whisking and whisk for 1 minute. You will now have a thinner liquid. If you have an ice cream maker then follow the instructions. If you don’t have an ice cream maker then don’t despair just follow the steps below and although it won’t be quite as smooth it is very nice. Leave the mixture to cool down and then pour into a suitable container for freezing. Freeze until it is half frozen 2-3 hrs and then run a fork through the mix and return to the freezer, repeat this once or twice more and then cover the container and freeze completely. You will then have a beautiful lemongrass flavoured ice cream. My aim is to cook as naturally as possible and not use any preservatives. We grow what we can or buy/ forage locally and always organically. Our water is well water and the only thing I use is electric from the authority. Gas is bottled. As you can see the Coconut is a very versatile product and a healthy one and one with many uses around the home. Fresh Coconut juice is my first drink of the day. This week I have just got the inside of the coconut. The outer shell already removed as this was brought to me by my Thai family. It is so much easier than trying to get the hard shell off the coconut. It also cleared up the mystery of what they were as I had seen many stalls by the roadside selling these. My favourite place to drink it is on the beach, but now I live in Northern Thailand I have to make do with just the drink and my dreams. Once they are finished however it will be a short walk into town for me to see my little man who does all the hard work and sells it ready chilled in bags with a little of the very soft flesh added. It is lovely and at 20 baht a bag well worth it. 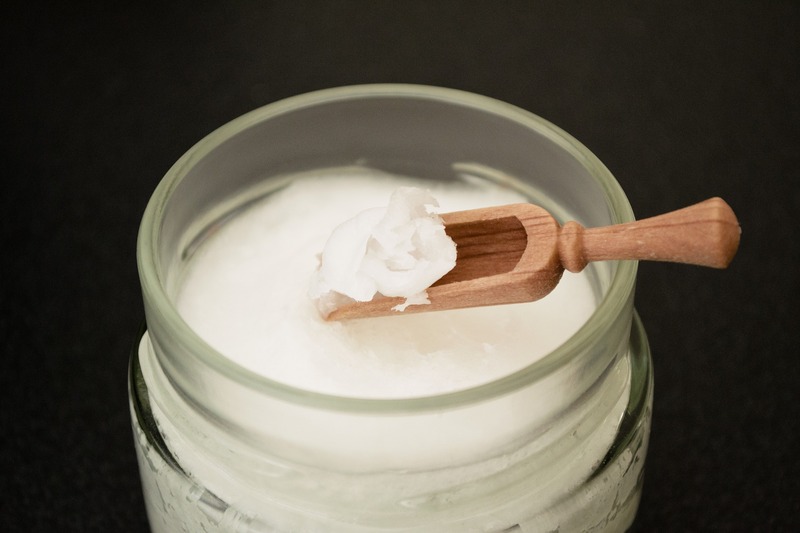 Did you know you can use coconut oil to polish your leather handbags or shoes try it and you will be amazed at the result? Also, the very soft inner cream of the small very young coconuts is lovely for babies when they first start eating solid food. Both of my grandchildren were fed on it as tiny babies, it is so easily digested and perfect for young tummies. Oil pulling which I do every day before I do anything, I use it as it deodorises your mouth and gums and it seems to be a great way of warding off any sore throats, although I think the honey helps as well. A spoonful of honey and a coconut oil gargle and my sore throats vanish. She has found the oil is very effective at stopping any burning. I also cook with as it is safer at higher temperatures and doesn’t give off any nasties like some other oils. Just a word of advice though and don’t do what I did. Do not mix Coconut oil with any other oil…Moi did ( when I didn’t ) have enough coconut oil and wanted a bit more oil, bad move! I got a foaming mess that just kept foaming and foaming. Other uses for coconut cream/water in my household. I use the milk in shakes, curries and it is a lovely thing. Even lovelier if I can get it freshly made from the market. What do you use Coconut oil or cream for ?????????? If you fancy making your own Coconut oil, maybe as a present then I have attached a link with instructions. Have fun! This entry was posted in Coconut milk, Coconuts, Cooking from scratch, The Coconut, Uncategorized and tagged Coconut milk, Lemongrass Icecream, The Coconut on May 17, 2018 by CarolCooks2. Stop whatever you are doing and make this now. Because fudge. It’s no secret that I love food. And it’s not just the eating of food that I like; I love that food can bring people together, can represent and define cultures, and can soothe and comfort. Typically I prefer savory foods. I will choose bacon with biscuits and gravy over pancakes every single time. Night time snack? Popcorn. Usually buttered and seasoned with some weird concoction I made up on a whim. But there is no question: I LOVE FUDGE. 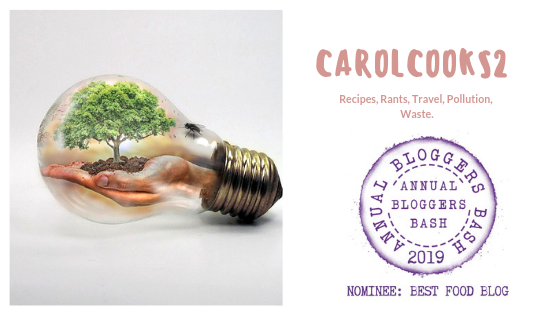 This entry was posted in Chocolate Fudge, Coconut milk, Sea salt, Uncategorized, Vegan and tagged Coconut milk, melte chocolate, Sea salt, Vegan on August 7, 2017 by CarolCooks2. How to make your own Coconut Oil. Living in the North Of Thailand is so very different from living in the South of Thailand.. I am learning so much about Thai cultures and traditions which have been passed down through families for centuries and I am loving it. Coconut oil and its benefits are known throughout the world and it is quite easy to buy a bottle from your local shops now….. But how is it made? it is still made by hand in many local homes here..it takes time but you get a far superior product and you also get the lovely by-product which you can eat. So come with me ……Over a fire…. 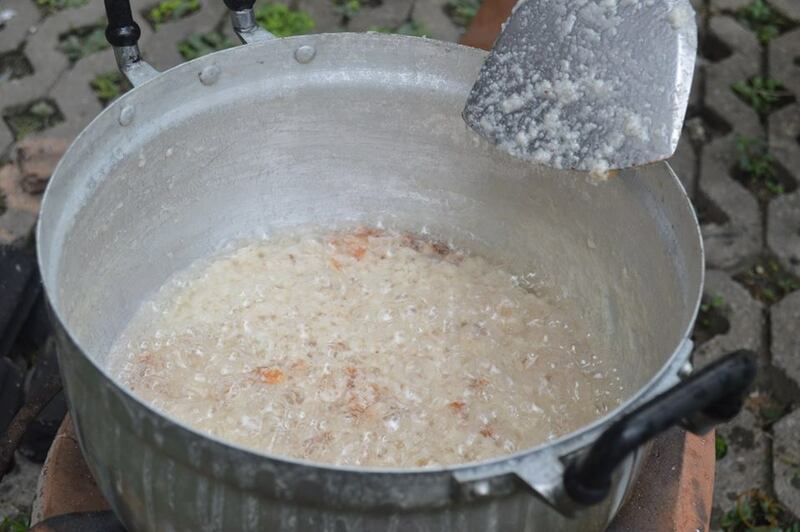 a pot is put to heat up when the pot is hot then the coconut milk which is extracted from the white flesh is added, in the villages they grate this and as you need the flesh from 10 coconuts to make a litre of oil …it is time-consuming and hard work by hand…. 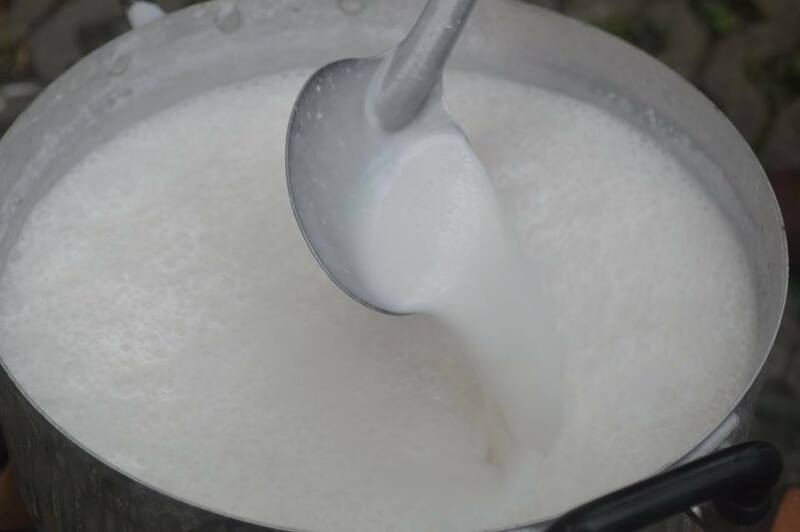 If you are lucky enough to live close to a local market and they have the machine which extracts the milk then it is far easier although you still have a long way to go before you get the finished product. 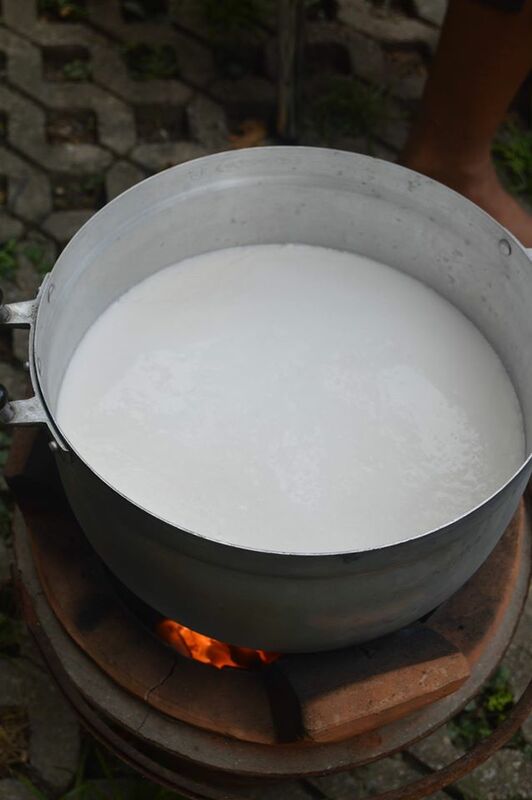 Firstly the Coconut milk is poured into the ready heated pot and it is now a waiting game where all the exciting stuff happens and you can see the stages and transitions that milk goes through to get your oil. So you sit and stir and watch and wait while still stirring as the milk changes. The first sign you see are little oil spots which start to appear on the surface of the milk….you still have to keep stirring. 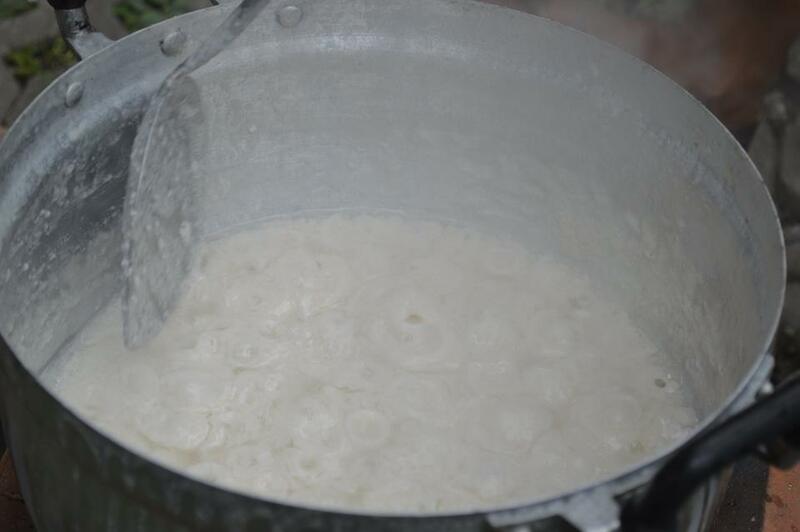 The oil spots spread as the milk bubbles away and indeed will come right to the top of the pot and almost boil over. At the bottom of the pan you get a thick crust which looks like crumbled digestive biscuits…this is scooped out and kept as a topping for ice cream. A very small amount is left in the bottom maybe a teaspoonful and this gives the oil a more vanilla/chocolate smell/taste it is then scooped out and the oil is left to cool down. 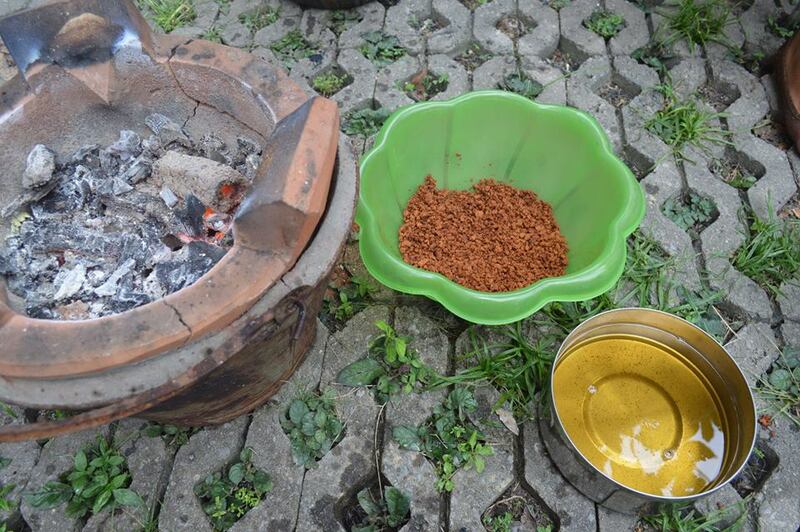 You now have your very own hand-made Coconut Oil. I think it is lovely to see this tradition of making your own oil in the home as so often we buy a carton or bottle and we don’t where it has come from ..what processes it has gone through…Is it pure? We all know that labelling can be misleading. I am sampling so much now of lovely home produced oils, honey, vegetables, herbs some grown some foraged and it is not just the marvellous taste but just the knowledge that I have seen it made or helped make it and that I know where it has come from..it is a marvellous feeling .. 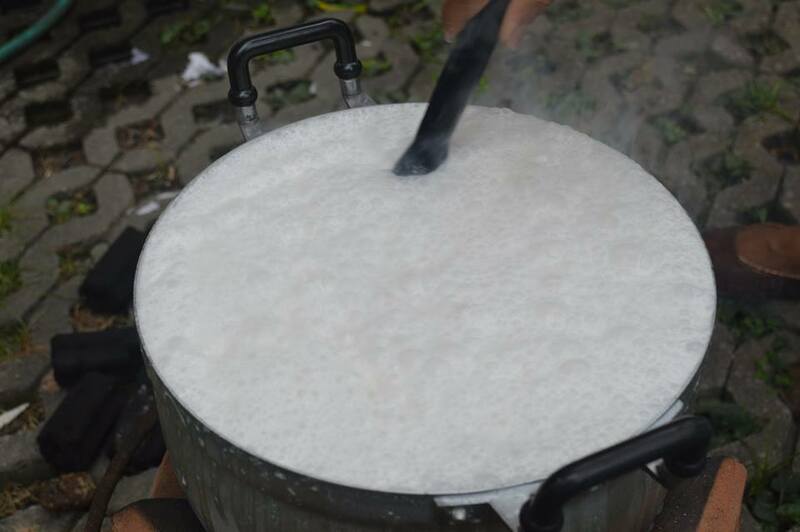 This entry was posted in A Taste of Thailand, Coconut milk, Cook from scratch, How to make your own Coconut Oil, Retired! 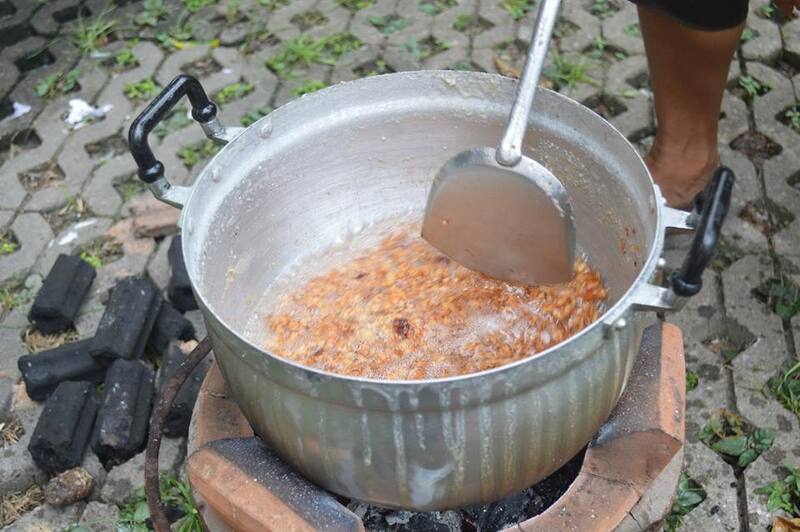 No one told me!, Rural Thailand, Uncategorized and tagged How to make Coconut oil, Life style, Northern Thialnd, Thailand on March 24, 2017 by CarolCooks2.